EXCLUSIVE Like all the top custom builders, the Wrenchmonkees have a clear and consistent vision. And this, bike #45 from the Copenhagen workshop, could be their best yet. It’s a little less grungy than some of their earlier work, with glossy paint on the tank. But the low-key colours, blacked-out components and perfectly-judged stance make this Kawasaki Z750 instantly recognizable as a Wrenchmonkees build. 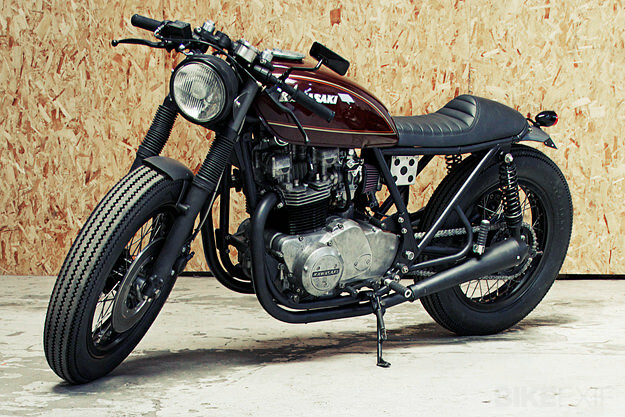 It started life as a 1977 Z750B, earmarked as a scrambler project in the style of WM #6. “We spent a year moving the bike around in the workshop and mocking-up different approaches,” says Andreas Mørk-Hansen. 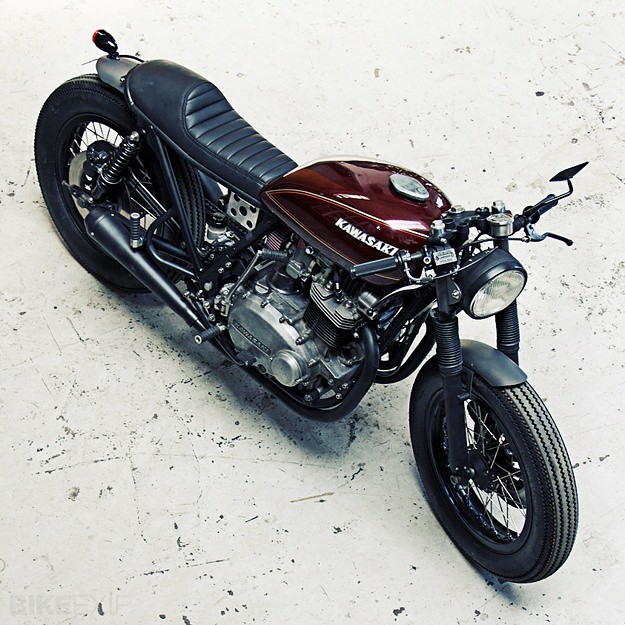 “Then a customer walked in and ordered a Z750. 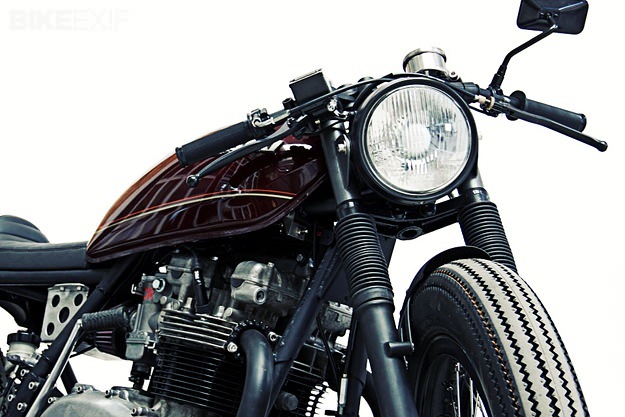 But not a scrambler: He wanted a cafe racer, so we had to change direction.” The customer specified the Firestone tires and the original Kawasaki tank, but apart from that, the Wrenchmonkees were given free rein. and a no-nonsense two-into-two exhaust system, finished in black. The rear frame loop, seat, battery case, fenders and headlamp brackets are all custom fabrications. The stance is improved immeasurably by the custom 18” Borrani-style rims—which are an inch smaller than stock at the front. The forks and rear swingarm setup have been lowered slightly. New shocks and an upgraded brake system have tightened up the dynamics. On the scales, this Z750 weighs some 20 kg less than a showroom machine—which improves the rider experience still further. It’s a bike that shows the Wrenchmonkees at the peak of their powers, with an innate understanding of how to create a killer custom motorcycle. 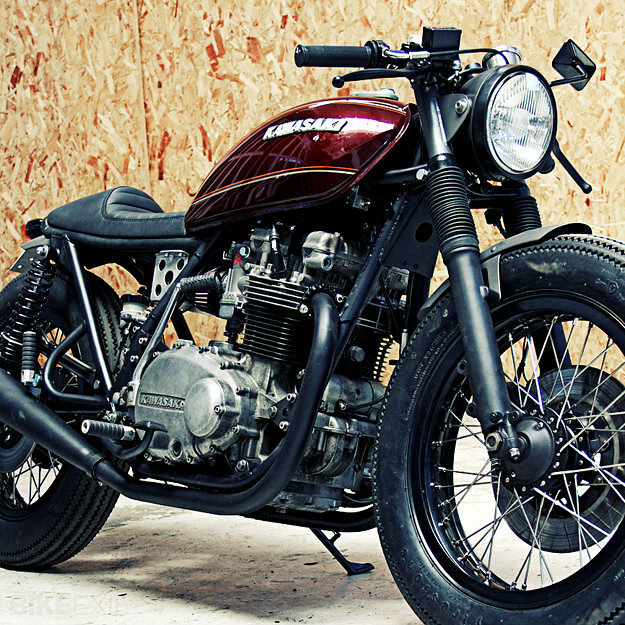 I’d put this Z750 in my garage in a shot. Bike EXIF has covered the Wrenchmonkees extensively over the past four years. Check out our archive of previous WM builds here.